Stars and Stripes today offers an in-depth look at the return home of one Fort Drum, N.Y., soldier following a 17-month deployment to Afghanistan. The House Veterans Affairs Committee goes high tech this Tuesday when the April 1, 2008 Subcommittee on Health “PTSD Treatment and Research: Moving Ahead Toward Recovery” hearing is webcast at 10 a.m. EST. Cumberland County, Tenn., officially welcomes home its Vietnam veterans this weekend proving that it's never too late to thank those who serve in uniform. Military Handbooks' 2008 crop of pdf offerings have arrived -- and they're free for the asking. Stop-loss, colloquially referred to as the "Back Door Draft," refers to the controversial policy, authorized by Congress when the draft ended but not utilized by the military until the Gulf War, of retaining soldiers beyond their expected terms and sending them back to war zones for second and even third tours of duty. According to this film, an estimated 81,000 soldiers have thus far been stop-lossed in Iraq. In "Stop-Loss," Sgt. Brandon King (a stronger-than-usual Ryan Phillippe) is one such soldier. Returning to Brazos, Texas, where he and his fellow hometown combatants receive heroes' welcomes, he discovers he has been stop-lossed. Raging against the system, he goes AWOL – accompanied by Michelle (Abbie Cornish), the girlfriend of his war buddy Steve – in hopes of winning over the senator (Josef Sommer) who awarded him the Purple Heart and Silver Star in Washington, D.C. We already know, even if Brandon does not, that his quest is futile. This is director Kimberly Peirce's first feature since her debut "Boys Don't Cry" nine years ago. She deserved a less clichéd script (which she wrote with Mark Richard). To an even greater extent than was true of such films as "In the Valley of Elah" and "Grace Is Gone," "Stop-Loss" dramatizes the Iraq war and its home-front losses in ways that summon up Vietnam-era movies as disparate as "Coming Home" and "The Deer Hunter." On Wednesday, 200 social service workers gathered at the Virginia is for Heroes regional conference held at Fort Monroe. A few helpful articles over there, especially "Tune In to Special Needs of Military Families [pdf] ," by Barbara J. Howard, M.D. Jenny Eliscu offers a heart-tugging update on James Blake Miller, 'The Marlboro Marine,' in the latest Rolling Stone. Following-up on yesterday's post, the Topeka Capital-Journal editorial board chimes in on news that unemployment in the younger veterans set had shot up to 23 percent in 2005 from 2000's 10 percent rate. From last week: A University of Texas Health Science Center at San Antonio research consortium has been awarded $33 million from the DoD to study post-traumatic stress disorder (PTSD) in returning troops. Their main objective will be to "develop and evaluate the most effective early-interventions for detecting, preventing and treating combat-related PTSD." My work on the PTSD Timeline has gone on hiatus again for the past few months as I juggle four NIU classes and all other things (dropping so much along the way -- including far too many wonderful emails from PTSD Combat visitors, I'm afraid; I apologize to those that have gone unanswered). Yet, the press-reported incidents of a wide variety of reintegration problems awaiting our returning troops continue to scream out from all corners of our county. Collection of these incidents continues behind-the-scenes, too. While I save them for a time when I can go about the work of submitting them to my colleagues over at ePluribus Media, I rarely point these individual cases out here at PTSD Combat (except when writing about the occasional incident or when sharing news of a batch of our latest timeline entries). I'm not sure I ever set about explaining why I don't, as a rule, share these difficult stories with you as I find them. The reasons are many-fold, the main one being simply that I don't want the incidents themselves to be the sensational driver of my work here. I think most of the readers that visit this online journal already know that these incidents are taking place; they don't need further proof. A new government report paints a dire picture of the employment prospects of returning military veterans, concluding that young veterans earn less and have a harder time finding work than do civilians in the same age group. The report prepared for the Veterans Affairs Department found that the percentage of veterans not in the labor force -- because they couldn't find jobs, stopped looking for work, or went back to school -- jumped to 23% in 2005 from 10% in 2000. Half of the young veterans -- ages 20 to 24 -- with steady employment earned less than $25,000 per year, it found. Young veterans "face career challenges when transitioning from the military service to the civilian workforce," and suffer from higher unemployment than their civilian peers, the report said. "Transitioning into civilian life and the workforce requires help and guidance," the report concluded. "The federal government might consider reevaluating or refining how it serves...these returning young service members to ensure a successful transition process." A first-ever survey of returning state troops shows that at least one-quarter of them meet the diagnostic criteria for post-traumatic stress disorder, while many cite problems with a spouse or partner and difficulties "connecting emotionally with family" as major concerns. A state mental health hot line [866-251-2913] has fielded more than 300 calls for assistance from Iraq and Afghanistan veterans and their family members in the past nine months. Recently, the state veterans' affairs commissioner has begun working with the courts to ensure that increasing numbers of recently returned troops who are arrested for domestic violence, drunken driving or other offenses are flagged and referred to counseling programs. "There's a lot of real high risks here — not only for the military members themselves, but for their families," said Linda Schwartz, commissioner of the state Department of Veterans' Affairs. "We have people in almost every town in our state who have served deployments, and the VA is just not going to be able to get to them all. We have to do more to reach out to them … to catch them when they fall." The Defense Department "is dedicated to supporting evidence-based approaches to medical treatment and wants to support the use of alternative therapies if they are proven efficacious," notes a recently-issued request for proposals. Full Defense Center of Excellence for Psychological Health (PH) and Traumatic Brain Injury (TBI) program announcement for the Military Psychological Health Research – Complementary and Alternative Strategies grant is available online as an MS Word doc. Grant instructions and application forms are available, too. If you're a long-time reader, you're probably aware of the class action lawsuit filed last July against the Veterans Administration by two veterans groups. One of them, Veterans for Common Sense, is helmed by tireless former VA employee and veterans advocate Paul Sullivan. His important update and call for help in extended. Most patients have moderately severe pain resulting from their injuries one year after sustaining major trauma, according to a new article. "Pain is a natural accompaniment of acute injury to tissues and is expected in the setting of acute trauma," according to background information in the [JAMA Archives of Surgery] article. Together with the news that 25 fuel trucks transporting fuel to our forces in Afghanistan were bombed today, it is a sad Easter as we reach our 4,000th fatal casualty in the Iraq War (not confirmed yet in the media, but I have received word of it via email by a knowledgeable source; ICasualties.org is showing the same) alongside our 488th fatal loss in Afghanistan, Pakistan and Uzbekistan under the Operation Enduring Freedom umbrella. My thoughts and prayers to our military families. A roadside bomb killed four U.S. soldiers in Baghdad on Sunday, the military said, pushing the overall American death toll in the five-year war to at least 4,000. The grim milestone came on the same day that rockets and mortars pounded the U.S.-protected Green Zone, underscoring the fragile security situation and the resilience of both Sunni and Shiite extremist groups despite an overall lull in violence. On Thursday, CBS Evening News with Katie Couric ran an important story on the rapid rise of veteran suicide attempts currently receiving Veterans Administration care. Newly-released VA records show there were 462 system-wide suicide attempts by their patients in 2000. That number rose to 790 suicide attempts by VA patients in 2007, a 44 percent increase over seven years. Certain age groups found their numbers increase more than others. For example, 20- to 24-year olds attempted suicide 11 times in 2000; by 2007, that figure rose to 47. Meanwhile, patients attempting suicide in the 55 to 59 age category rose from 19 in 2000 to 117 in 2007. This week ushers in the 5th anniversary of the start of the war in Iraq. While war markers rarely bring a smile to the face as other anniversaries do, and while numbers are cold and sterile and harbor nothing of the humanity or gravity of such losses, they serve a useful purpose. They ask that we observe, if only briefly, the sacrifices made for us half a world away. Quick: Do you know how many troops have deployed, become injured, or even died so far? If you said 1.6 million (this first figure includes Afghanistan) have deployed you’d be on target. Toss in nearly 30,000 injured and nearly 4,000 killed in action in Iraq alone, and you’re totally engaged. According to a Pew Research News IQ survey released last week, only 28 percent of us currently know how many U.S. troops have died in Iraq. This figure is down from 54 percent in August 2007. The indifference or even boredom reflects what’s going on in the media, too. War coverage made up only 3 percent of last month’s overall “newshole,” down from July 2007’s more generous 15 percent slice of the news pie. IAVA is asking us to join together in signing an open letter to the media asking that they increase coverage of the Iraq war. They've made it easy for us to send via this handy online form. — Strategic mistakes that made the war longer and more lethal, including sending too few troops, not sealing Iraq's borders or arms depots, failing to recognize the insurgency early on and not planning how to secure the peace. — The nature of the war. The lack of front lines made everyone vulnerable at any time, increasing the danger and stress. The insurgents' use of improvised explosive devices has produced devastating injuries. Multiple deployments and the unprecedented use of the National Guard and Reserves increased the risks, especially of stress-related problems. — A lack of preparedness for the volume of casualties, which overwhelmed the system. Additionally, the military missed many cases of post-traumatic stress disorder or traumatic brain injury by relying on soldiers to come forward. Of the 1.7 million service members with recent combat experience, some 800,000 are now veterans entitled to VA health care and benefits. Of those, 300,000 have had treatment; 40 percent were diagnosed with a mental health problem, more than half with PTSD, according to Veterans Affairs figures released as a result of a lawsuit by Veterans for Common Sense, a nonpartisan veterans advocacy group. My work is about relationships among people, with self, with the universe. It’s a study of why we are here, what makes us who we are and how each one of us affect everyone and everything around us. I move shapes and lines until they work together to soothe and heal. Kim, who in the past has practiced a wide variety of art expression including bronze casting and mural painting, was kind enough to answer a few of my questions regarding her ethereal ceramic sculptures. I believe her creations and answers offer us a glimpse into the heart of someone processing their PTSD. Her impressions are deep, funny at times, and always thought-provoking. A heartfelt thanks to Kim for sharing so much with us. The Senate moved Thursday to add $50 million to the fiscal 2009 Department of Veterans Affairs budget specifically to speed the processing of disability claims. By voice vote and with no opposition, the Senate revised the 2009 federal budget to include an amendment sponsored by Sen. Blanche Lincoln, D-Ark., adding the money for VA claims processing. The Senate’s budget resolution, S. Con. Res. 70, which lays out guidelines for federal spending for the fiscal year that begins Oct. 1, already included a $3.2 billion increase in veterans’ funding over the Bush administration request. The $50 million increase would apply to the general administration account for the Veterans Benefits Administration, which processes benefits claims. The money is earmarked for pilot programs to find ways to cut the average waiting time for a ruling on a claim, currently six months for initial claims. Lincoln thinks working the problem from that direction could have a bigger long-term effect than continuing to hire more people to try to whittle down the huge backlog of claims. The Winter Soldier: Iraq and Afghanistan testimonies begin at the National Labor College near Washington, D.C., today and continue through Sunday. The event title hearkens back to the 1776 writings of Thomas Paine: "These are the times that try men's souls. The summer soldier and sunshine patriot will, in this crisis, shrink from the service of his country; but he that stands by it now, deserves the love and thanks of man and woman." This panel will look at neglect and abuse of veterans and service members with regards to their mental and physical health. Testimonies will include accounts about the impact of an under-funded Veterans Administration, injured soldiers being forced back into combat without fully recovering from their wounds, cases of the military’s denial of mental healthcare for those suffering from post traumatic stress syndrome and exposure of service members to depleted uranium munitions and other hazardous materials. Listen in via online stream or check other viewing options. In addition to the expected physical drawbacks of suffering combat-zone hearing injuries (now being called the "the silent epidemic"), I wonder what, if any, psychological effects these persistent wounds have on our soldiers. Are returning vets with ringing or buzzing ears, also known as tinnitus, at a disadvantage when it comes to putting the war behind them? What effect does the constant reminder of the IED blast or RPG attack they survived have on them? Top officials from the departments of Veterans Affairs and Defense said on Tuesday that they plan to improve the health care for troops wounded in Iraq and Afghanistan by providing them with "a life map for recovery" that integrates all their heath records into one package and lays out a listing of follow-up services. In a joint statement submitted to a hearing of the Senate Veterans Affairs Committee, Dr. Lynda Davis, deputy assistant secretary of the Navy for Military Personnel Policy, and Kristin Day, chief consultant for care management and social work at VA, said Defense and VA partnered in October to establish the Joint VA/Defense Federal Recovery Coordinator Program. Program coordination officials will develop several Web-based applications, including a Federal Individual Recovery Plan and a National Resource Directory, they said. They will team with military health care personnel to use the recovery plan to create in one set of documents a so-called life map for recovery for wounded, ill or injured service members, as well as veterans and their families. The recovery plan will provide a complete menu of care (integrated documents that include all health services and health organizations, including longitudinal records, and clinical and nonclinical services) to service members headed back to duty or retirement, Davis and Day said. The plan will include information on support services and resources for health care providers and the wounded service members and veterans, they added. Up to 20% of soldiers serving in Iraq and Afghanistan get TBI according to an Army report [pdf] released in January. In addition to the 1-in-5 figure, some returning soldiers with the milder form of TBI (aka concussions) don't even know they have the injury most associated with IED attacks. The military had been flat-footed in the opening years of the war when it came to treating TBI; their limitations in care are still apparent. Fortunately, some private health care providers are providing relief to military families trying to recover from the more devastating of TBI injuries. Sunday's CBS Evening News interviewed Brig. Gen. Donald Bradshaw, who heads up the military's TBI Task Force, on these issues. Sad conclusion to the latest missing Iraq veteran case. Condolences to Eric Hall's family and a great debt of gratitude to the volunteer Vietnam veteran, Charles Shaughnessy, who would not leave a fellow battle brother behind until he was found. The father of Missing Marine Eric Hall says he believes the body found this weekend in Deep Creek is his son's. Kevin Hall says the body found in a drainage pipe by a volunteer had a titanium hip like Eric's and had on the same clothes Eric was wearing the night he disappeared. Hall has been missing since February 3rd when a witness told wink news he saw Hall jump off his motorcycle and run into the woods. His family says Eric suffered from Post Traumatic Stress Syndrome after a tour of duty in Iraq. The Medical Examiner's Office is still awaiting dental records for an identification of the body. The family has scheduled a memorial service for Eric Hall. It will be held this Thursday, March 13th at noon at the Faith Lutheran Church in Punta Gorda. The family says Eric will be buried at home in Indiana. The Philadelphia Inquirer spent nearly a year reaching out to the Pennsylvania National Guard's Alpha Company following their return from Iraq. They lost six troops while overseas; the Inquirer spoke with almost all of the 131 who made it home alive. The paper's coverage, packaged in a four-part series, began yesterday. Of all the things that Alpha Company has had to struggle with since it came home from Iraq, the most pervasive may be post-traumatic stress disorder, or PTSD. Of the 126 veterans interviewed or surveyed by The Inquirer, almost half - 46 percent - said they had been treated for PTSD, most at VA hospitals and clinics in the region. Alpha's rate of PTSD is higher than that of most U.S. troops who served in Iraq or Afghanistan - partly, no doubt, as a result of its being a frontline combat unit that lost six men. Shelley M. MacDermid, a Purdue University professor who served on a Defense Department mental-health task force last year, said typical PTSD rates among returning veterans were about 14 percent. "Those are big numbers," she said of The Inquirer's Alpha findings. National Guard and Reserve units, in general, have shown slightly higher PTSD rates than have regular Army units, she said. The Defense Department task force said this might be in part because civilian-soldiers were separated after they returned home, rather than staying together as units in which the members could support one another. Ira Katz, director of mental-health services for the Department of Veterans Affairs, said that among the 300,000 or so veterans who have been seen by the VA, about 20 percent have been diagnosed with PTSD. But he said that twice that number - about 40 percent - have had some "mental condition." "That's not all that different from your  percent," he said. Both MacDermid and Katz said that PTSD had become a popular shorthand for all sorts of emotional symptoms that veterans experience. These may include depression and anxiety disorders, but not rise to the level of PTSD. Secretary of the Army Pete Geren will be asked today to convene a panel of officers to investigate "Army policies and practices which permit the deployment of medically unfit soldiers." Spec. Bryan Currie, 21, of Charleston, S.C., will ask Geren to convene a Court of Inquiry — a rarely used administrative fact-finding process — to investigate top generals at Fort Carson; Fort Drum, N.Y.; and Fort Hood, Texas. A Court of Inquiry is composed of at least three high-ranking military officers and can subpoena civilians. Geren can refuse the request. "It's very important for the Army and very important for my clients. This is an investigation that is long overdue," said Louis Font, a Boston attorney who represents Currie and Spec. Alex Lotero, 21, a Fort Carson soldier from Miami. The request says the Court of Inquiry should "investigate the extent to which the (generals) have been derelict in failing to provide for the health and welfare of wounded soldiers." How will this bill benefit returning veterans? U.S. troops on the battlefield found it harder to get the mental health care they needed last year, when violence rose in Afghanistan and new tactics pushed soldiers in Iraq farther from their operating bases. A report the Army released Thursday recommends sending civilian psychiatrists to the warfront, supplementing members of the uniformed mental health corps. Surveying a force strained by its seventh year of war, officials found that more than one in four soldiers on repeat tours of duty screened positive for anxiety, depression and other mental health problems. That was comparable to the previous year. The report found more troops reported marital problems, an increased suicide rate, higher morale in Iraq, but a greater percentage of depression among soldiers in Afghanistan. "They do show the effects of a long war," said Col. Elspeth Ritchie, psychiatry consultant to Army Surgeon General Lt. Gen. Eric Schoomaker. Added Maj. Gen. Gale S. Pollock, a deputy surgeon general: "I think the fact that they are doing as well as they are with the demands they are under speaks to a strength and resiliency of the men and women of America." The report was drawn from the work of a team of mental health experts who traveled to the wars last fall. The experts surveyed more than 2,200 soldiers in Iraq and nearly 900 in Afghanistan. The nation's foremost authority on post-traumatic stress disorder testified in federal court Monday that up to 30 percent of combat veterans of Iraq and Afghanistan are likely to be diagnosed with the ailment and that the Veteran's Health Administration is not doing enough to help them. Dr. Arthur Blank, a psychiatrist who has worked with troops and veterans with PTSD since 1965, said the disorder is treatable, but it requires a "human connection" with a therapist, and that's something the VA is ill-prepared to support. "With hope and with help, recovery is possible," he said. Dr. Blank testified at a hearing in connection with a lawsuit brought by veterans advocacy groups against the VA, claiming that the federal government's health care system for troops returning from Iraq and Afghanistan illegally denies care and benefits. The plaintiffs, Veterans for Common Sense and Veterans United for Truth, are seeking to make the case a class action on behalf of 320,000 to 800,000 veterans or their survivors. The hearing Monday concerned a request by the veterans groups that the judge issue a preliminary injunction ordering the VA to provide immediate mental health treatment for veterans who suffer from stress disorders and are at risk of suicide. In combat, the older former warrior told the young Marines, "funny things happen." Weeks, months and even years after combat, he continued, those "funny things" can re-emerge as haunting nightmares, jittery paranoia or the root of any number of abhorrent and self-destructive behaviors. "You cannot take a normal person and put them in that environment without it affecting them," the speaker, David Pelkey, told about 25 Camp Pendleton Marines who recently returned from Iraq. Pelkey, a Mira Mesa resident and a Vietnam veteran who served in the Army's 1st Cavalry Division, is the national director of American Combat Veterans of War, a nonprofit group founded seven years ago by Carlsbad resident Bill Rider, also a Vietnam veteran. "We try to use ourselves as an example of what not to do in terms of denying the fact that you have been impacted by the war," Rider said about the program. While theirs is not the only program about post-traumatic stress, Rider said that American Combat Veterans of War is unique in providing firsthand advice from other veterans to the troops. "We're here because we care about you, damn it, and there's something you don't understand that we do," said retired Marine Col. Al Slater, a Navy Cross recipient who also spoke to the returning troops. "We don't want your generation to go through the hell we did." * Up to one-half of those seeking help for substance-abuse disorders (SUDs) also have posttraumatic stress disorder (PTSD). * New findings show that the frequency of a PTSD is greater among those dependent on drugs rather than alcohol, and that having a PTSD tends to predict a more severe course and worse outcome for an SUD. From one-third to one-half of those seeking treatment for a substance-use disorder (SUD) can also have posttraumatic stress disorder (PTSD). The first multi-center study of PTSD among individuals seeking treatment for an SUD has found a greater prevalence of PTSD among those who were drug- rather than alcohol-dependent, and that having PTSD was associated with a more severe course and worse outcome for an SUD. Results are published in the March issue of Alcoholism: Clinical & Experimental Research. "We already knew that there is a quite relevant association between PTSD and SUDs," said Martin Driessen, professor of psychiatry at Ev. Hospital Bielefeld in Germany, and corresponding author for the study. 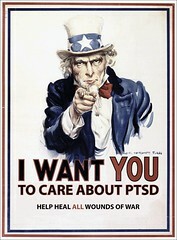 "More specifically, PTSD is a risk factor for the development of an SUD, particularly a drug dependence. However, it was unclear whether this is true for both abusers and dependent subjects, or only one of these groups, which is why we studied clearly dependent subjects." "Drug dependence has frequently been observed in war veterans who also suffer from PTSD," added Andreas Heinz, director and chair of the department of psychiatry at Charité - University Medical Center Berlin. "Both men and women often increase drug abuse and develop dependence following war and other trauma."